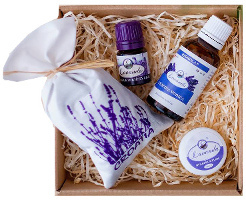 The Lavender Gift Set is an authentic gift from Croatia. The Lavender flower will refresh every corner of your home, we especially recommend its use in wardrobes. Lavender essential oil is used for body care and more commonly as a room refreshener in aroma lamps. Lavender balm softens and nourishes dry, rough and broken skin. The hydrolate of lavender is intended for all skin types, and helps with insect bites.